Surfing Magazine has released this spellbinding drone footage of surfers charging the infamous Teahupo’o wave break in Tahiti. The footage provides a new beautiful perspective of this powerful surf spot. The name ‘Teahupo’o’ loosely translates to English as “to sever the head” and is regarded as one of the most challenging surf breaks in the world. The wipeout 3:17 minutes into the video helps explain why. The drone piloting at the 3:30 mark, when the camera films two waves in a single sequence, is incredible. And to top it all off I’m pretty sure the surfer at 3:53 is lit on fire! The moody music is a song by Brigitte Fontaine called “Le Goudron”. Do the video justice and watch it at full screen with volume up. 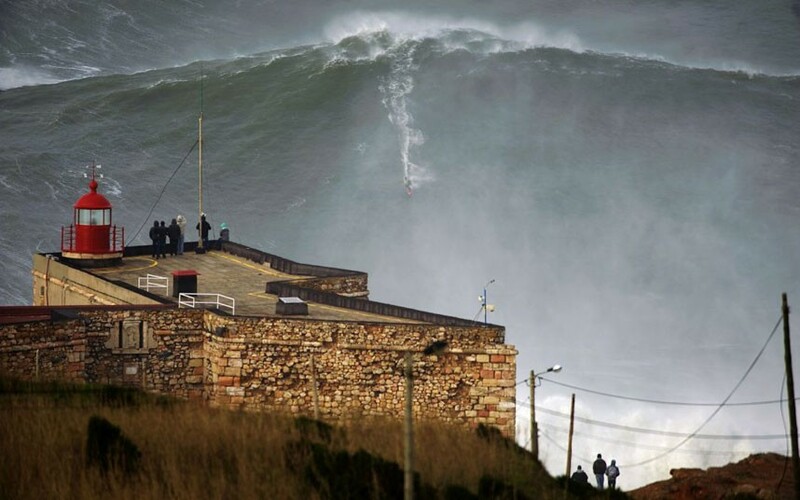 Last week Garrett McNamara broke his own record by surfing a 100 foot wave off the coast of Nazaré, Portugal. Garrett is that tiny speck seen in the terrifying photograph above. Regardless of whether or not it’s a new record, the man is insane. 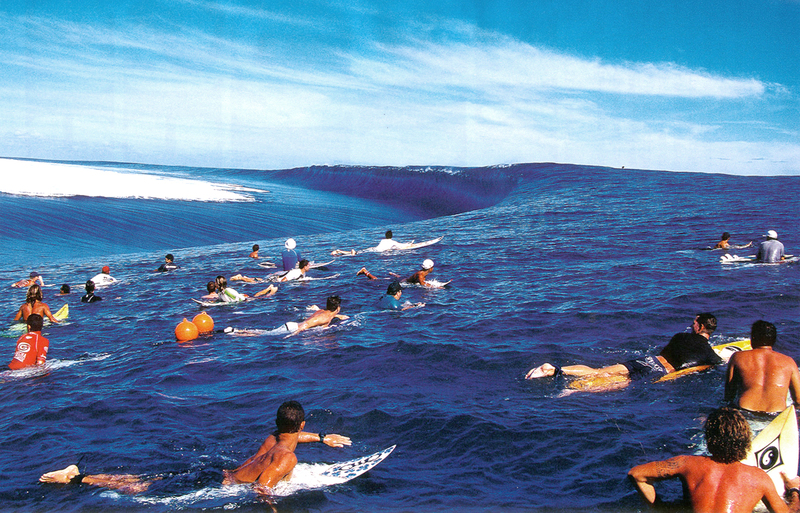 Teahupo’o is the name of a large reef break in Tahiti. Named after a village on the southwest coast of the island, the break is renowned for its consistent barrels, heavy waves and shallow shoreline. An extremely shallow coral reef, which ranges up to 20 inches beneath the water’s surface creates an unusual wave shape with an effect of almost breaking below sea level. The wave’s unique shape is due to the specific shape of the reef beneath the wave. Its semi circular nature, which drops down sharply creates a ‘below water’ effect and the extreme angles in descent create an instant instability to the wave. The extreme angle creates instant instability in the wave. The second stage of the reef proceeds uniformly down to the 300 metres contour in about 50 metres of distance, or a ratio of about 1/6 (.1667). The maximum steepness a wave is able to endure before it breaks is .17. So when height (h) is > .17 of wavelength (λ) then the wave will break. The reef at Teahupoo moves the entire available energy mass of the wave all the way from 300m to the 10m mark of the first stage of the reef at the maximum angle permissible prior to a wave breaking. Then at 10m prior to reaching the surface it puts up a steep wall of reef that causes the entire mass to fold onto a scalloped semi-circle breaking arc. The result is an incredible moving wall of water. The video below was taken August 27th 2011 during the Billabong Pro waiting period. The French Navy labeled this day a double code red prohibiting and threatening to arrest anyone that entered the water. Garrett McNamara recently broke the world record for largest wave ever surfed. McNamara was towed into a 90-foot wall of watery death at Praia do Norte, Nazare, on the southern shores of Portugal. The previous record of 77 feet was set by Mike Parsons in 2008. And in case you were wondering, the biggest wave ever recorded by scientists measured 1,720 feet in height and killed two fishermen as it slammed down into Lituya Bay, a fjord located on the coast of Alaska on July 9 1958. Professional Waterman Chuck Patterson, skis down the face of Jaws. Peʻahi, also known as Jaws, is one of the largest surf breaks in Maui. Chuck takes it on like nobody else in history ever has. Be sure to watch this HD video in full screen. Chuck Patterson wasn’t the first to ski on waves. Mike Douglas and Cody Townsend skied on waves in Hawaii a year before Chuck but the waves Mike and Cody experimented on weren’t nearly the size of those produced at Jaws. Needless to say, I would NOT like to be underwater with ski boots and poles on – waves or not. Alls you needs is a tarp and a skateboard – though, a clean offshore breeze really folds over the tube nicely.